I would assume everyone in St. Albans knows Heald Funeral Home. I didn't know the first Winslow Heald but I did know the first Raymond Heald and the tremendous way he supported my St. Albans Family when my Aunt died at a young age in the 50's. After that it was Bud and Win that took care of my family in the 60's, 70's, 80's. A local minister for 14 years, I also worked with the Healds in many tough situations. This past November my husband, another local minister in St. Albans for 14 years died and his wishes had always been for Heald Funeral Home to be in charge. I am quite sure he never thought that he would outlive Bud and Win but as it turned out, he did. So, it was Rhett and his colleague, Lucien Hayes, that were in charge. They came cross State to Wells River to take care of my family this past winter and to make sure that everything went smoothly for my husband's funeral in Orford, NH. We buried my husband, the Rev. R. Ward Wilson, this past Sunday, Father's Day, at Greenwood Cemetery. Sometimes a family business goes down hill as the next generation assumes the leadership role but certainly not in this case. The Heald Funeral Home excels in compassion and professionalism at the time of a death and when you have known them for awhile, it is as if "family" were taking care of you. It has always been that way and it still is that way. As our world becomes fixated on technology, a faster way of life and financial greed, isn't it remarkable and wonderful that there is a family business that continues to get the human condition and offer the appropriate care when a family is in its worse crisis. Thank you Healds and all other small businesses that continue to put people and service first. 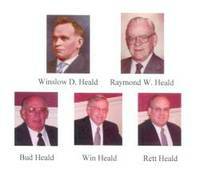 The Heald Funeral Home was founded in 1918 by Winslow D. Heald. He and his wife, Lottie (Bliss) Heald, had nine boys and two girls. They operated a livery stable and provided horse-drawn hearses and hacks (taxis) in the St. Albans area. Of the eleven children, only Raymond decided to enter the funeral service profession. Raymond died in 1983. Two of Raymond’s sons, Howard “Bud” and Winslow “Win”, became funeral directors as did Bud’s son, Raymond, better known as “Rett”. The funeral home started on Kingman Street in St. Albans and later moved to Rugg Street where the King’s Daughters Home now stands. In 1943, Raymond purchased the present location at 87 South Main Street. The original house was built in 1820 and is the third oldest in St. Albans. Additions have been made over the years to what is now a very warm and beautiful place, well designed for it’s intended use.